One of Americas favortite whiskeys, The Jack Daniels name is know world wide. 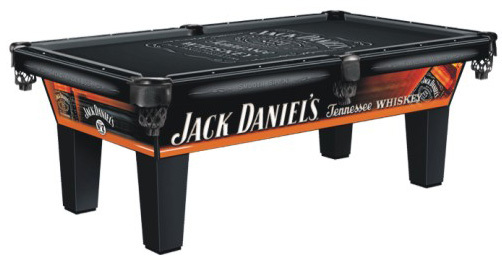 And now you can own your own Jack Daniels pool table. Crafted by Olhausen Billiards and made in the USA. The eight foot pool table is made not only to last generations but to play like a champ. 1" thick slate which has been diamond honed flat makes one of the best playing surfaces in the world today. Visit our Jack Daniels Page below and learn more about this iconic American Brand. Diamondback Billiards carries the full line of Olhausen Pool Tables. Olhausen and Jack Daniel have teamed up to create this premium pool table with the Jack Daniels Logo spanning the apron. You can rest assured we offer multiple options to customize your new pool table and make it a perfect match just for you. Call our pool table experts at 480-792-1115 and get fitted to the perfect table for you.